Not sure how a handful of ingredients atop a chunk of iceberg lettuce can be so tasty. If you ever had Wedge Salad from the popular steak restaurant chain, you know how good it is. We think it is the balsamic that makes this salad so good. Sometimes I dress it with Ranch dressing and top with feta for those that aren’t fond of blue cheese. Chill serving plates, forks and iceberg wedges until ready to serve. When ready to serve, assemble salads. Place one wedge on each of 4/6 chilled plates. Place halved grape tomatoes on the sides of the wedge, distributing evenly among each plate. Evenly divide the onions among the plates. 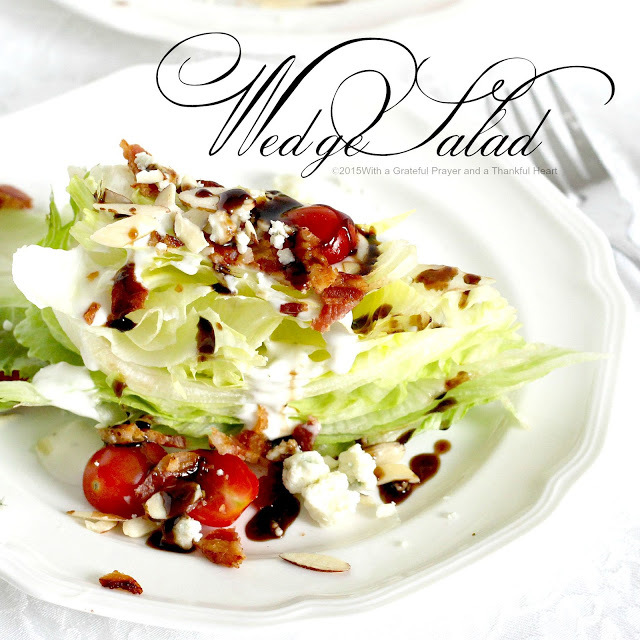 Drizzle each wedge with 1/4 cup blue cheese dressing. Sprinkle crumbled bacon among plates and over wedge. Sprinkle 1 tablespoon blue cheese crumbles on each wedge. 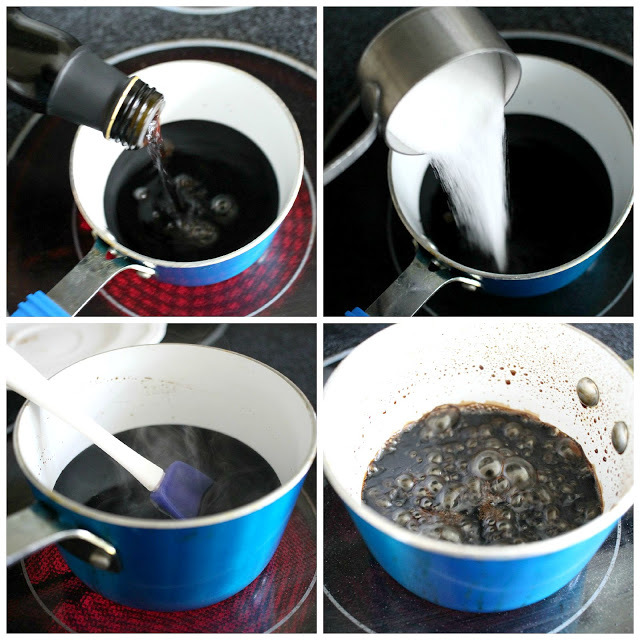 Lightly drizzle balsamic glaze over wedge or serve on the side. 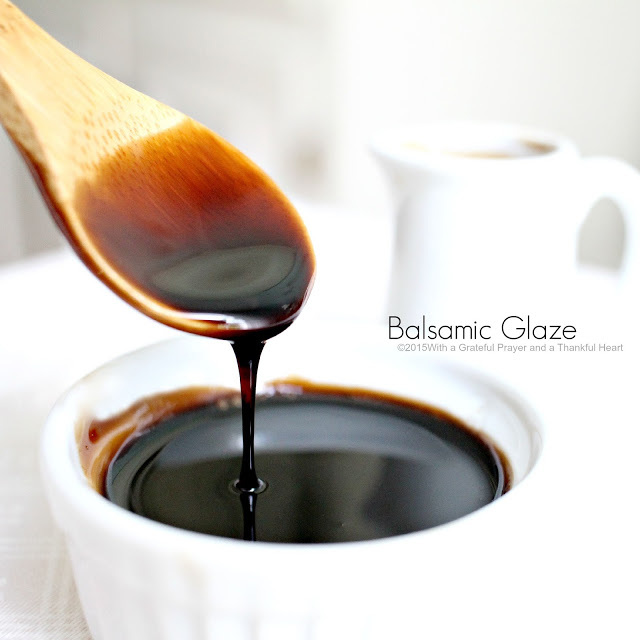 Bring 1 cup balsamic vinegar and 1/4 cup sugar and a few grains of salt to a boil; reduce heat and simmer about 15-20 minutes or until glaze coats the back of a spoon and reduces to about half. Cook longer for thicker glaze (glaze thickens as it cools). I use a small saucepan with high sides to avoid splattering. If you use a shallow pan, the balsamic may reduce faster because of more surface area. Watch closely as not to burn. Refrigerate any leftover glaze for 1 week. This reminds me of my mom and her friends who served this salad often at their gatherings "in the old days". Now, thanks to your post, it will be my turn. I've never heard of balsamic glaze before but it sounds delicious – i have a feeling it is going to feature often in my kitchen in the very nr future.